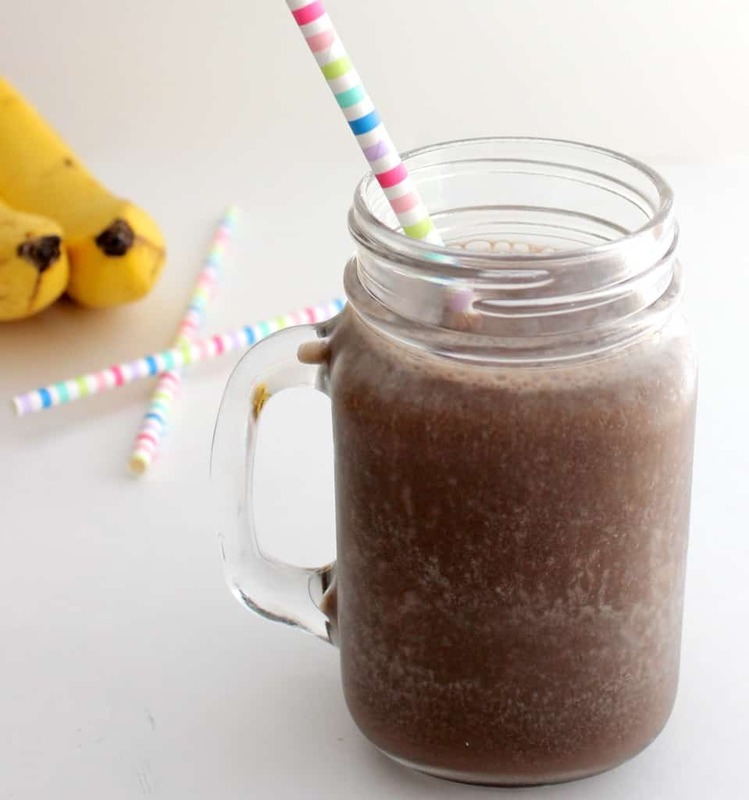 This thick and creamy banana chocolate smoothie made with just two ingredients is the perfect summer treat! I’m sharing a super simple recipe today for one of my favorite summer treats. Ice cream is, of course, my #1 favorite indulgence, but when chocolate cravings hit and I want something a little healthier than a bowl of ice cream, I love making a banana chocolate smoothie. 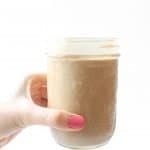 For a mocha chocolate smoothie, you can substitute some of the almond milk for chilled coffee or just add a light sprinkle of espresso powder. For a protein boost, you can add a scoop of protein powder. And, to make a green smoothie and add some extra iron, you can add a big handful of fresh spinach– if you blend it in well, I promise that you won’t be able to taste it. When I lived at home, I’d frequently make a double batch of this smoothie to share with my brother and I’d usually add a big handful of spinach. He loved the smoothie and had no idea there was spinach in it until he saw me add it one day. From that point on, he was convinced that he could taste the spinach. So, moral of the story: if you have picky kids/siblings/friends, the spinach part can be our little secret. Enjoy! 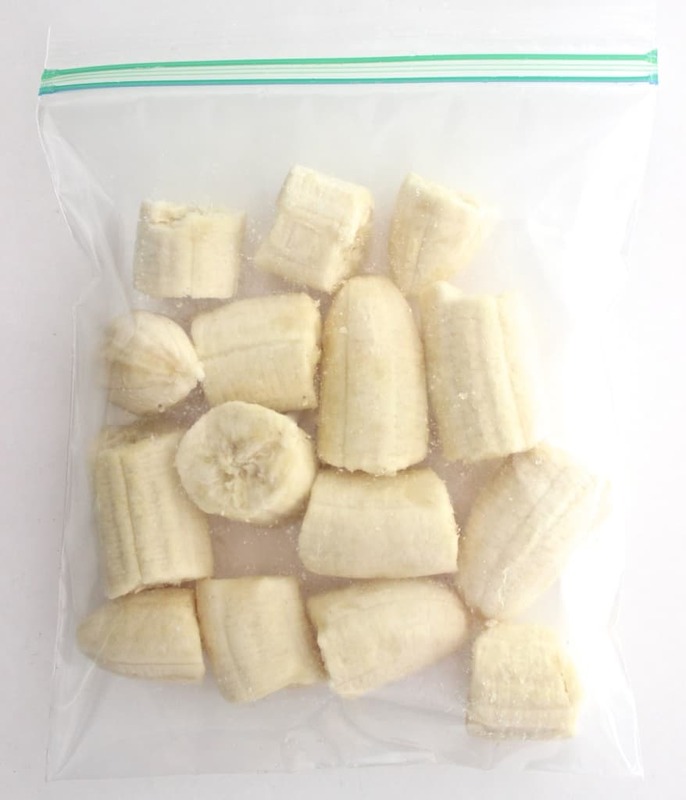 Cube the bananas and place in a freezer bag. Freeze for at least 8 hours, or up to a week in advance. Pour chocolate almond milk into blender. If using spinach, protein powder, or espresso powder, blend these with almond milk on high until smooth. Then, add frozen banana chunks and blend on high until just the bananas are just combined (over-blending will lead to a thinner smoothie). Drink immediately or place in freezer for up to 20 minute before enjoying. 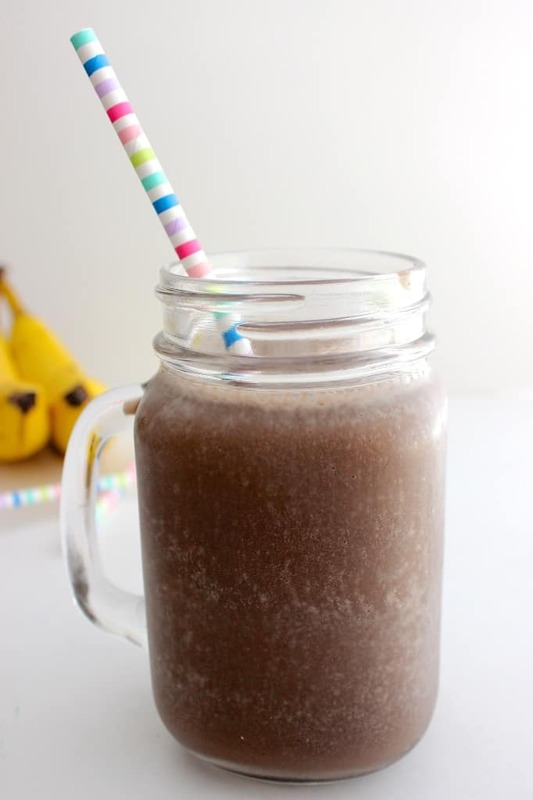 It's worth noting that while the ingredients for the smoothie are healthy, the smoothie is still a bit high in sugar since bananas have lots of natural sugar and the chocolate almond milk has some sugar, as well. So, if you're carefully limiting your sugar intake, this smoothie (or any smoothie, really) may not be the best choice. This is one of my favourite drinks at the moment. We always keep bananas in the freezer. 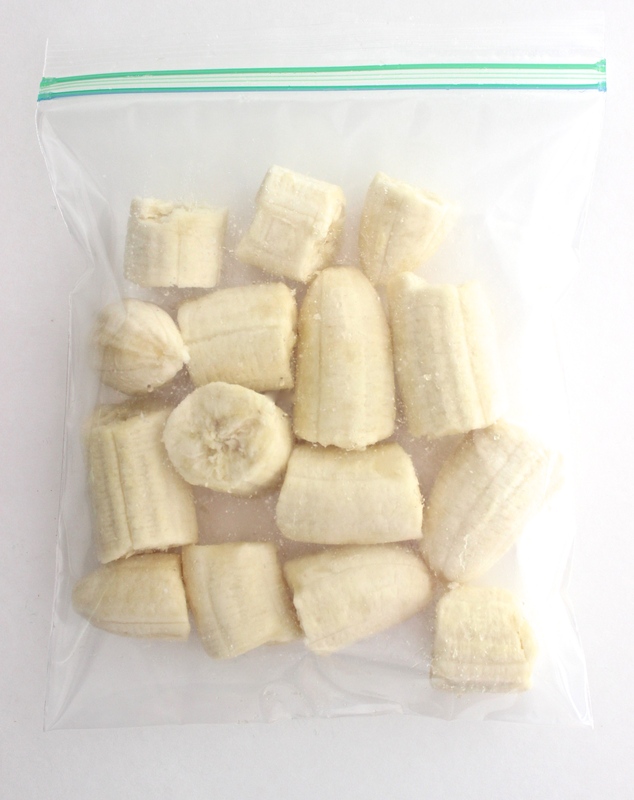 Frozen banana chunks are one of my freezer staples, for sure! You can never go wrong with this one! It’s like a healthy frosty. The texture and thickness totally remind me of a frosty! Where have I been living?! I need to try this chocolate almond milk ASAP. I’m usually not a big fan of drinking milk or almond milk straight up, but I can drink dark chocolate almond milk by itself no problem! I agree! We make these double chocolate banana muffins sometimes that are SO good and super moist from the bananas. Do you use vanilla almond milk when you cook? I love the vanilla almond milk in cereal and smoothies but haven’t cooked with it, so I usually stick to the original or unsweetened (or chocolate!) kinds. Oh, and in regards to your comment, it is a-okay! Reading so many posts at a time can be tricky. 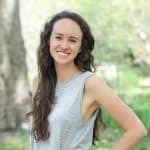 I think I have to go read her post now! Definitely- it was a great post! Super easy recipe – love it! I always have a smoothie for breakfast or dinner and chocolate is almost ALWAYS involved. Also – frozen bananas are my jam : ) Hope you have a great weekend! Smoothie recipes almost seem silly since they’re so basic, but I love seeing what combinations other people come up with! 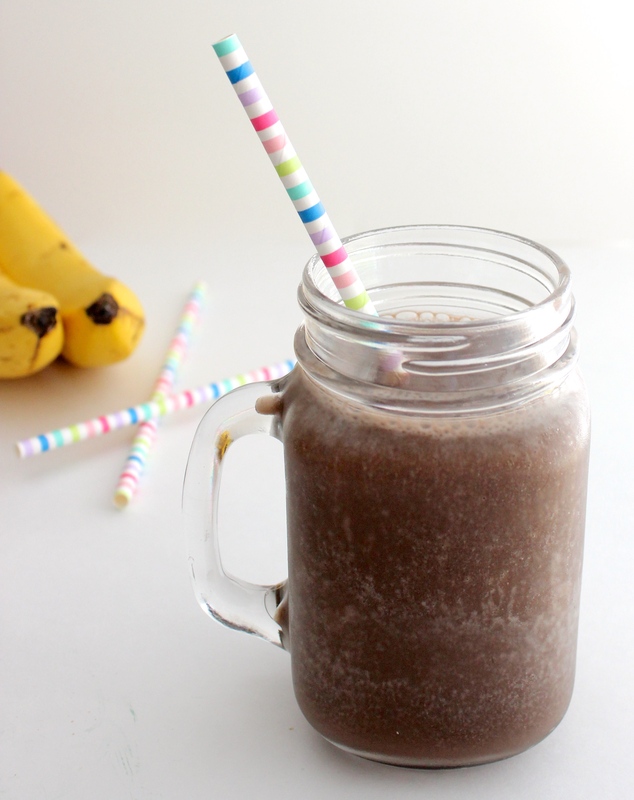 I already drink it, banana-chocolate-smoothie. It is really great and very tasty. If you will add coffee flavor, It will be more tasty. I already added. try this. I agree, it really is so yummy!